This article is about the writer. For the actor, see Allan Steele. 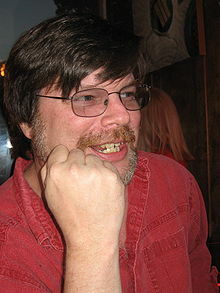 Allen Mulherin Steele, Jr. (born January 19, 1958) is an American journalist and science fiction author. Steele was born in Nashville, Tennessee on January 19, 1958. Steele was introduced to science fiction fandom attending meetings of Nashville's science fiction club. He graduated high school from the Webb School in Bell Buckle, Tennessee, received a bachelor's degree from New England College and a Master's from the University of Missouri. Before he established himself as a science fiction author, he spent several years working as a journalist. Steele began publishing short stories in 1988. His early novels formed a future history beginning with Orbital Decay and continuing through Labyrinth of Night. Some of his early novels such as Orbital Decay and Lunar Descent were about blue-collar workers working on future construction projects in space. Since 1992, he has tended to focus on stand-alone projects and short stories, although he has written five novels about the moon Coyote. Steele serves on the Board of Advisors for both the Space Frontier Foundation and the Science Fiction and Fantasy Writers of America, and he is a former member (Eastern Regional Director) of the SFWA Board of Directors. In April 2001, he testified before the Subcommittee on Space and Aeronautics of the U.S. House of Representatives, in hearings regarding space exploration in the 21st century. In 2004, he contributed a chapter to the collaborative hoax novel, Atlanta Nights. 1996: Hugo Award for "The Death of Captain Future"
1997: Locus Award for ""... Where Angels Fear to Tread""
1997: Science Fiction Chronicle Readers Award for ""... Where Angels Fear to Tread""
1998: Hugo Award for ""... Where Angels Fear to Tread""
1998: Seiun Award for "The Death of Captain Future"
2002: Asimov's Readers' Award for "Stealing Alabama"
2005: Asimov's Readers' Award for "The Garcia Narrows Bridge"
2011: Hugo Award for "The Emperor of Mars"
2013: Seiun Award for "The Emperor of Mars"
2014: Asimov's Readers' Award for "The Legion of Tomorrow"
"Sixteen Million Leagues from Versailles" 2013 "Sixteen million leagues from Versailles". Analog. 133 (10): 8–22. October 2013. Dozois, Gardner, ed. (2014). The year's best science fiction : thirty-first annual collection. St Martin's Griffin. Dozois, Gardner, ed. (2014). The mammoth book of best new SF 27. Robinson. ^ Thomas, Lynne. "LibGuides. Rare Books and Special Collections At Northern Illinois University. Previous SFWA Officers Listing". libguides.niu.edu. Retrieved 2015-10-19. ^ Steele, Allen. "Allen Steele Biography". allensteele.com. Retrieved 2016-11-21. ^ "Steele and Kondo Win 2013 Heinlein Award". locusmag.com. Locus Publications. 2013-01-28. Retrieved 2016-11-21. ^ "Asimov's Readers' Awards". asimovs.com. Penny Publications, LLC. Retrieved 2016-11-21. ^ "Official site: Bibliography". Retrieved September 27, 2014. ^ DeNardo, John (February 14, 2013). George R.R. Martin; Gardner Dozois, eds. "TOC: Old Mars". SF Signal. Retrieved September 26, 2014. ^ Bedford, Robert H. (October 8, 2013). George R.R. Martin; Gardner Dozois, eds. "Mars as We Thought it Could Be: Old Mars". Tor.com. Retrieved September 26, 2014. ^ "Not A Blog: Venus In March". GRRM.livejournal.com. June 19, 2014. Archived from the original on August 21, 2014. Retrieved September 27, 2014.